This is my first year participating in this Read-a-thon. It's hosted here by Wishful Endings. As with other readathons this year, I will be posting sign-up and goal progress in the same post. As a plus, that's new to me, they also have a read-a-thon group on Goodreads for this yearly event. The group is here and I just joined when finding it. It will be fun to participate in both places. 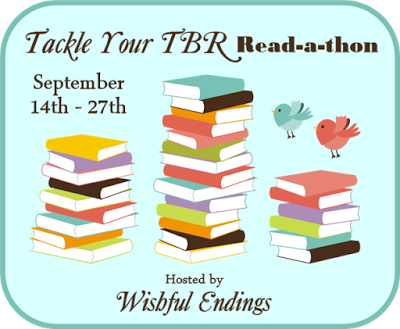 The Tackle Your TBR Read-a-thon begins Monday, September 14th and ends Sunday, September 27th, with a wrap-up (including giveaway winners) on September 28th. You do not have to be a blogger to sign up. Just use your Goodreads, Twitter, Facebook, Pinterest, Instagram, or Tumblr, or leave a comment stating that you'll just post updates on my blog commenting on my updates instead (just pick a place you're going to post updates on). I am currently reading several books so will just read what I happen to be reading at the time. I'm not listing a planned list of books to complete, only with the goal to READ as much as possible and enjoy the fun and challenge of reading goals as a group. This read-a-thon will be overlapping another seasonal read-a-thon at the same time that I already signed up for, Fall Into Books Readathon 2015.